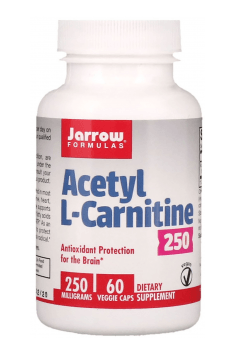 Jarrow Formulas Acetyl L-Carnitine is a dietary supplement containing the acetylated form of the L-carnitine amino acid, which penetrates the blood-brain barrier most efficiently from all forms of L-carnitine. The product contributes to increased energy production in the mitochondria and improves brain cognitive functions. The package contains 60 vegan capsules, each containing 250 mg of acetyl L-carnitine. Acetyl L-carnitine (ALCAR) is an acetylated form of the L-carnitine amino acid, classified as a vitamin-like substance. Of all the available forms of L-carnitine, ALCAR is the most effective to penetrate the blood-brain barrier. L-carnitine supplementation affects the proper metabolism of the body, but the acetylated form of this amino acid has a lot better effect on the functioning of the brain. L-carnitine belongs to endogenous amino acids because it can be produced in the body from lysine and methionine. The most abundant amounts of L-carnitine can be found in animal products (especially in red meat). In plants, however, it occurs in much smaller quantities. Consequently, people who exclude or severely limit meat consumption may suffer from L-carnitine deficiency. Acetyl L-carnitine supports cognitive functions and has a neuroprotective effect. The substance helps to increase the acetylcholine (ACh) biosynthesis in the brain. This is mainly due to the fact that ALCAR supplies acetyl groups involved in the production of ACh. It contributes to the increase in the availability of acetyl coenzyme A (Acetyl-CoA), which is combined with choline through choline acetyltransferase enzyme. This leads to an increase in ACh levels in the cells. ACh is a very important neurotransmitter responsible for communication and information flow in the body, as well as for the reception of stimuli from the internal and external environment. It also participates in the creation of memory traces, and its high level facilitates the learning process, recalling memories or improving the quality of sleep. The improved brain function may be associated with the increased brain metabolism and increased glucose uptake. In animal studies, an increase of the brain metabolism was noted by up to 20%. In addition, ALCAR stimulates the activity of superoxide dismutase (SOD), an antioxidant enzyme that helps in getting rid of reactive oxygen species and toxic metals. It also protects the nerve cells during hypoxia. Studies have also shown that ALCAR supplementation can prevent brain deterioration in stressful periods. ALCAR is often used in therapy to slow down the loss of brain function underlying neurological disorders such as Alzheimer's or Parkinson's diseases. ALCAR can also be helpful in reducing the symptoms of depression and social phobia because it stimulates the production of serotonin, norepinephrine, and dopamine. ALCAR supports the functioning of mitochondria. Mitochondria are popularly called "energy furnaces" because it is in them that the energy generation process takes place. Mitochondria take oxygen and nutrients from food to produce adenosine triphosphate (ATP), which is the basic energy carrier in the body. ALCAR supplementation can, therefore, increase energy levels during the day and during physical activity. The supplementation is also recommended in chronic fatigue. In one study, it was shown that ALCAR supplementation increased the use of oxygen by cells. Mitochondria are also responsible for getting rid of free radicals and toxins. The mitochondria themselves are sensitive to free radicals, and ALCAR supplementation positively affects the condition and number of mitochondria in cells. Studies have also shown that ALCAR has protective effects on both mitochondria and whole cells, inhibiting damage to the mitochondrial membrane and cell membrane caused by free radicals. ALCAR supports fat reduction. L-carnitine allows the passage of fatty acids into the mitochondrion so that they can undergo a beta-oxidation process. In this process, the stored fats are converted into energy, which promotes a better reduction of weight. ALCAR helps to increase the body's efficiency. This substance is used to improve the anaerobic capacity of the body and body’s performance. The research shows that increased level of L-carnitine in muscles supports their metabolism, extending the energy exhaustion time. What is more, people who supplement L-carnitine have less muscular injuries caused by strength training, as well as reduced muscle pain after training, popularly called muscle sores. In summary, Jarrow Formulas Acetyl L-Carnitine is an acetylated form of L-carnitine, which effectively penetrates the blood-brain barier, and most positively from all of its forms affects the functioning of the nervous system. It supports the proper metabolism and functioning of mitochondria, and also increases the level of neurotransmitters responsible for memory and well-being. Acetyl L-Carnitine 250mg 60 caps. Take 1 capsule 1-2 times per day on an empty stomach or as recommended by a qualified healthcare professional. The standard recommended supplementation of L-carnitine ranges from 500-2000 mg. Acetyl L-carnitine is particularly used to support cognitive functions. The supplementation is considered relatively safe, and no side effects should occur when used at recommended doses. Depending on the desired effect, it can be combined with a source of choline, alpha-lipoic acid, caffeine, resveratrol, coenzyme Q10 or PQQ.